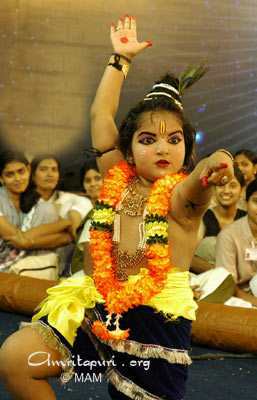 There will be a special Children’s Camp held at Amritapuri. The five-day camp is open to children aged 10-17 and is free of charge. Food and accommodation will be provided. The Malayalam-medium Camp’s mission is to help the children acquire balance of mind, the ability to face the challenges of education, attain confidence, and to understand and imbibe values. Yoga and meditation will also be taught. 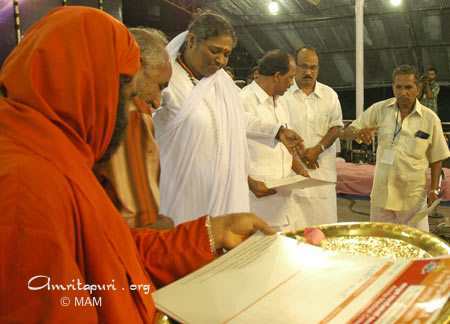 After the programs at Ernakulam Brahmastrhanam, Amma reached Palakkad ashram this evening around 8.00 p.m. Amma was warmly received by the devotees singing “Amma Amma Taye”. 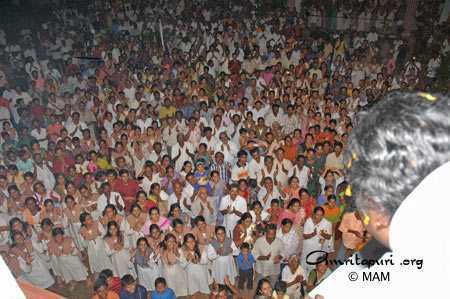 Amma will be here for the next two days participating in the Brahmasthanam Festival. The Amrita Health Card, a scheme instituted by the Amrita Institute of Medical Sciences (AIMS), to give free health care facilities to the rural poor, was launched today. Under the scheme, poor families around AIMS would be extended free medical aid up to Rs 10,000 per family per year. With Kerala steeped in the summer heat, Amma began her short tour of central Kerala this week, visiting first her ashram and Brahmasthanam Temple in Edappalli, Ernakulam. 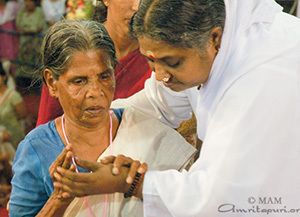 The heat was oppressive, but each night it rained, the temperatures dropped down, bringing external relief alongside with Amma’s inner-cooling touch. 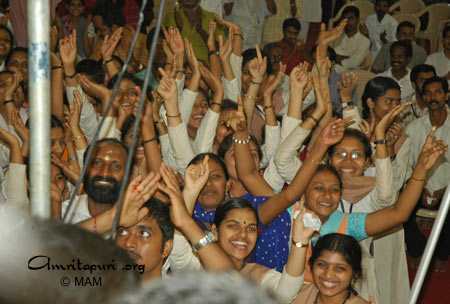 When Amma arrived at the ashram, the devotees all began singing and clapping “Amma Amma Taye!” It was an ecstatic moment, and before going to her room, Amma stood above the sea of devotees, gazing down at them, smiling and enjoying their innocent devotion. 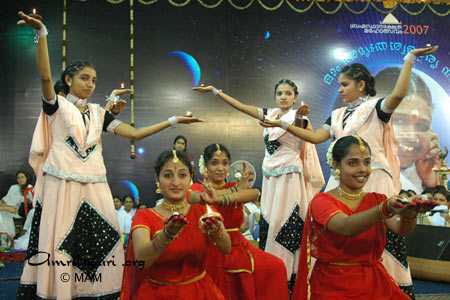 The first evening program in Kochi saw the inauguration of an Ashram program aimed at improving the health of impoverished families living around the Amrita Institute of Medical Science (AIMS). Through the Amrita Health Card Program, families living around AIMS will be provided free medical aid up to Rs 10,000 per year. MLAs Sri. K. Babu and Professor K.V. 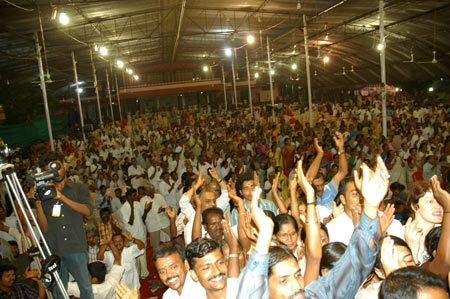 Tomas distributed a number of Health Care Cards on the dais alongside Amma. 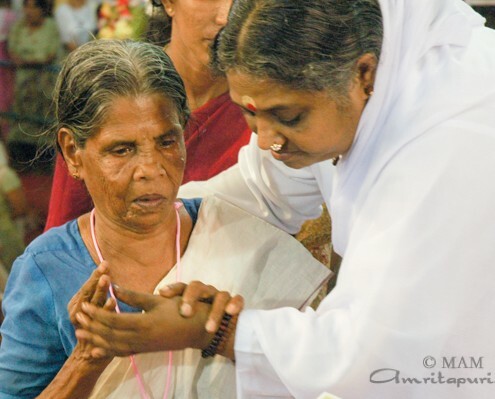 “Amma has reached here today to bless those suffering from pain and poverty. 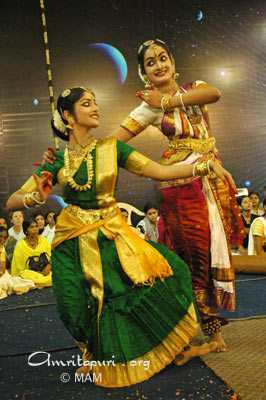 Amma’s affectionate embrace fills our minds with divinity,” said Professor Thomas. 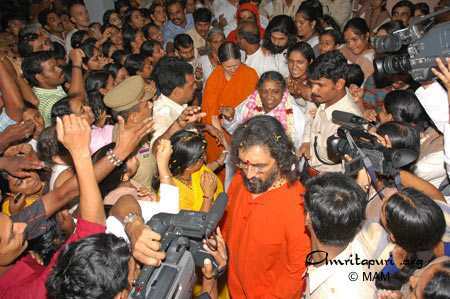 At the same function, a dozen widows and handicapped people were enrolled in the Amrita Nidhi by Sri. Mohammed Hanish, the District Collector of Ernakulam. Furthermore, 10 sewing machines were distributed to impoverished women under the Ashram’s Self Employment Program. The sewing machines were given away by Professor Antony Isaac, former GCDA chairman. At the end of darshan on the last night of the festival, some of the students studying at the Kochi campus of Amrita University asked Amma if she would sing “Mata Rani,” a bhajan to the Divine Mother that Amma has of late taken to singing at the end of darshan. 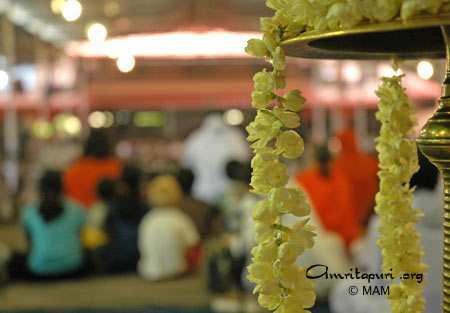 She acquiesced, and soon the whole hall erupted in Amma’s song. 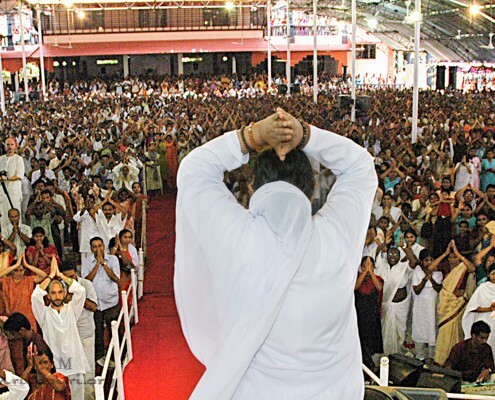 Amma… the students… ashramites… everyone was dancing and singing. 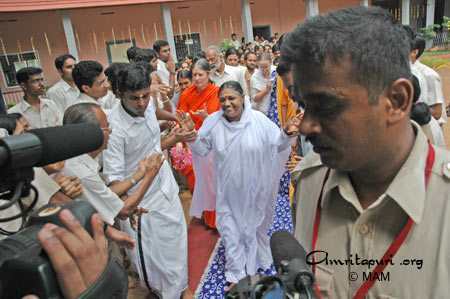 As darshan finished, the students “walked” Amma to her room, continuing to sing and clap and celebrate their moment with Amma. 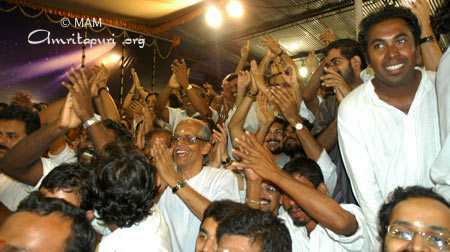 By eight in the evening, Amma reached Ernakulam Brahamasthanam. Enthusiastic students of Amrita University and devotees of Kochi welcomed Amma by singing “Amma Amma Taye.” Amma joined with them, clapping her hands for a while before retiring to her room. 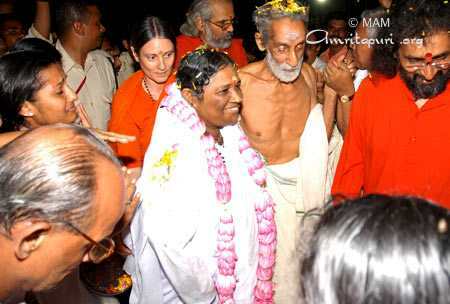 Upon Amma’s arrival, purna-kumbam was given to Amma by the famous Kerala temple priest, the 88-year-old Suryakaladi Bhattatirippad. Amma will be here for the next two days to participate in the Brahmasthanam festival. Today Amma will be leaving Amritapuri for the Central Kerala prgorammes, where she will participate in the Brahmasthanam Festivals of Ernakulam, Palakkad, and Trissur. Br. Shubamrita Chaitanya visited Israel from April 11 to April 18, 2007. He gave public talks at Jerusalem, Tel Aviv and Haifa which drew good crowds. There was an IAM meditation course held in Tel Aviv on the April 14 and the hall was packed with participants. The last day’s talk was held at the Ben Gurion University, Beer Sheva, one of the renowned Universities in Israel. Before the talk, Br. Shubamrita also visited NETFAM, the company which revolutionized drip irrigation all over the world. During his visit Br. Shubamrita also visited Yad Vashem (the Holocaust Museum) and the historic sites in Jerusalem, and near the Dead Sea. 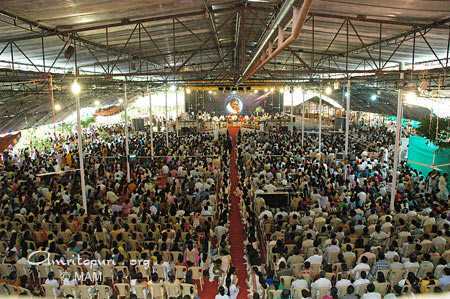 Many devotees send their heartfelt invitation through him to our Beloved Amma to visit Israel at the earliest. 200 people took part in the 1st IAM course offered in Chile on Saturday and Sunday april 21- 22, 2007. 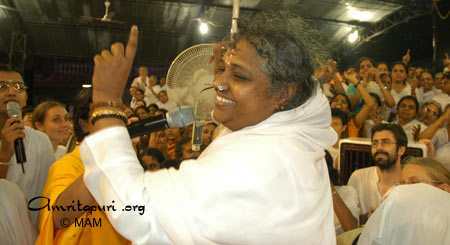 Today was the last day of darshan in Amritapuri before Amma’s the Central Kerala programmes. After darshan Amma had a photo session with this years out going batch of students of the Amrita University – Amritapuri campus, at their request. There will be a special Children’s Camp held at Amritapuri.The five-day camp is open to children aged 10-17 and is free of charge. Food and accommodation will be provided. If interested, please contact 0476 289 7578.